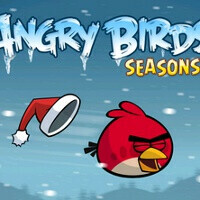 Angry Birds Seasons was the first offspring of the ever entertaining feathered action game and now, riding high the infuriated bird wave, Rovio confirmed in a tweet that an Easter edition of the game is to hit app stores in the very near future as scheduled. Easter falls on April 24th, but our guess would be that the game is to come out even earlier. Will we have our favorite birdies launched on bunnies or yet worse bunny-clad pigs? We can only guess, but what we know for sure is that the original version of Angry Birds along with Angry Birds Rio will receive updates in May. Now you have three more reasons to delay your withdrawal from gaming (if you've ever planned it), don't you? What next? Mother's day Special edition? Midsummer update? The game is crap as it is, but phone arena is beating a dead horse with all these GD angry birds posts... STOP, THE GAME IS OLD NEWS! Seriously people just love to complain about anything a site does that they dont like. Scrolling through you look and say 'What's this? An article on Angry Birds? Grr they made me waste 2 seconds reading the title of the article! I must click on it and comment to speak my frustrations that of such a terrible act of them to do this and to make an article that took more time for them to write than me to read! And even though I hate it, I read it anyways so as further to prove the idiocy that my rants dont do the justice of!"